Traditional medicine can only do so much in helping addicts overcome their condition and rehabilitate. While flushing the drug out of their system is vital, a full recovery process doesn’t stop there. Patients must address and come to terms with both their physical dependency as well as their mental and emotional one within a holistic treatment environment. Holistic treatments look beyond traditional medicine and integrate alternative therapies that work together to heal a disease or even prevent it. What Does Holistic Treatment Mean? Nowadays, many patients describe stress, depression, and other mental issues as triggers for a lot of their health problems. In some cases, these conditions can push people towards abusing certain substances, such as alcohol, opioids or prescribed meds. Aware of the connection between the human body and the spirit, holistic programs address every component and factor of a particular ailment. In essence, holistic means dealing with the whole of something, not just parts of it. This type of therapy will address not only the addiction itself but also the factors that contributed or promoted it. Originated in ancient India, Yoga is a holistic approach to life that involves not only physical but also spiritual practices. The essence of yoga is about equilibrium and meditation. The word itself, translated from Sanskrit refers to the union of the individual with the universe. Mediation is another excellent holistic treatment therapy that may help patients overcome their addiction. During a meditation session, the individual directs his thoughts on certain issues that he wants to heal. 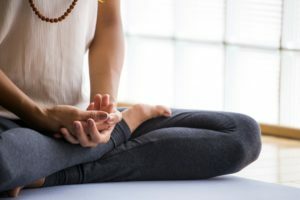 This technique can help reduce stress, stop over-thinking problems, or to induce a state of calm and relaxation. Sound therapy is a developing approach that stimulates the brain and induces specific emotion or effects. Scientists have discovered that music or different types of sound can improve communication skills, help alleviate chronic pain, and induce a state of calmness and relaxation. Spiritual counseling is another holistic treatment technique that focuses on the individual as part of the Universe. It seeks to heal the soul and cleanse it by relying on a few characteristics that every human must have, like compassion, authenticity, and integrity. What Are the Benefits of Using Holistic Treatment Methods? One significant advantage of holistic treatment is the complete healing of both body and soul. Spiritual balance is a highly important factor that contributes to a long-term recovery. Other benefits are: pain relief, the improvement of general health, and understanding of other natural resources that can help keep a balanced lifestyle. Holistic therapies are useful in all types of drug addiction and mental disorders, such as depression, OCD, post-traumatic stress disorder, and so on. How Can Holistic Therapies Be Intertwined with Traditional and Medication Based Treatment Approaches? Nowadays scientists all around the world agree that traditional medicine is just a part of the healing process. This is a fundamental aspect of holistic treatment. There are medical conditions where medications are not nearly enough to completely heal the individual, such as substance abuse or addiction. Traditional treatments are useful in the first stage of the process, allowing the patients to regain their strength and health while fighting the withdrawal symptoms. Learning to maintain that health is where holistic therapy is needed. Holistic treatment therapies address not only the disease itself but also the triggers and the psychological factors that contributed to it. Adventure programs and recreational therapy, along with meditation, motivational speeches, and family therapies are just a few of the useful tools of the holistic approach. It’s clear that an inpatient rehab center should employ professionals who know about addiction and recovery. What many people don’t realize is that if you only deal with addiction and not the issues accompanying a substance use disorder, you’re not receiving the comprehensive addiction rehab you deserve. Windward Way uses holistic approaches for addiction treatment, and both our alcohol and drug rehab programs incorporate these modalities. This begs the question—what is it? In a nutshell, holistic substance abuse treatment provides the tools to learn how to manage day-to-day living to prevent a client from flying off the handle and picking up a drink or drug as a “solution” to an uncomfortable situation. The holistic view of addiction is that imbalances create risky situations—holistic treatment therapies can give you the tools to learn how to cope another day without mind-altering substances. Our experts will target these modalities to meet each client’s personal preferences within our residential core program. We can build a plan including holistic treatment for you to find wellness again. Your journey to new life in recovery begins the moment you pick up a phone. Call us now: 855-491-7694.